Guy Madison signs an autograph for a fan at the Golden Boot Awards in 1986. Jim Roberts of Mississippi, who for years sponsored the annual Pre-Boot party at Sportsmen’s Lodge on Ventura Blvd. in Studio City, CA, is in the middle. 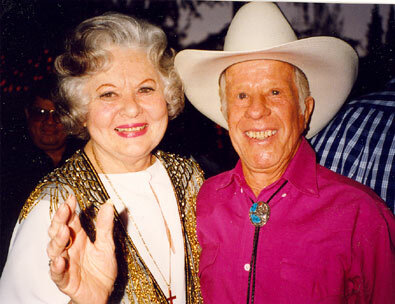 Adrian Booth and stuntman Whitey Hughes at the 1998 Golden Boot Awards in Los Angeles. Sunset Carson in Raleigh, NC, in 1989. 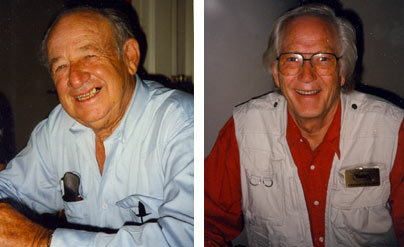 Tony Young and Adrian Booth at the Charlotte, NC, Western Film Fair in 1996. 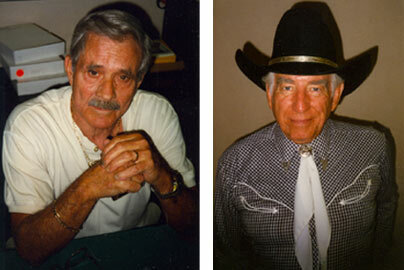 Stuntman/actor Bobby Hoy and Morgan Woodward at the Charlotte, NC, Western Film Fair in 1996. 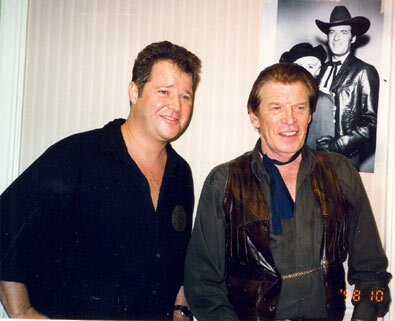 Jimmy Rogers and Greg Walcott at the Charlotte, NC, Western Film Fair in 1996. 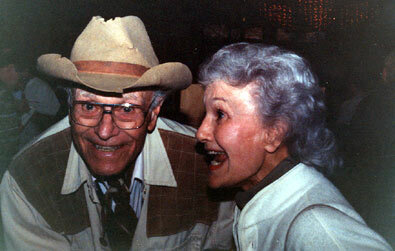 Boyd Magers of WESTERN CLIPPINGS has his arms full of pretty Jo Morrow at the Charlotte Western Film Festival in 2005. 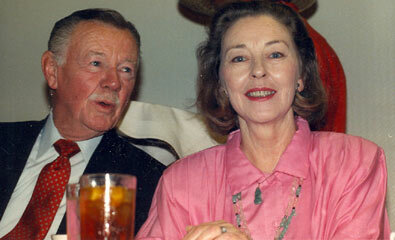 Jimmy Lydon and the gorgeous Lois Hall on the dais at the Memphis, TN, Film Festival in 1988. A great group at the Memphis, TN, Film Festival in 1992. 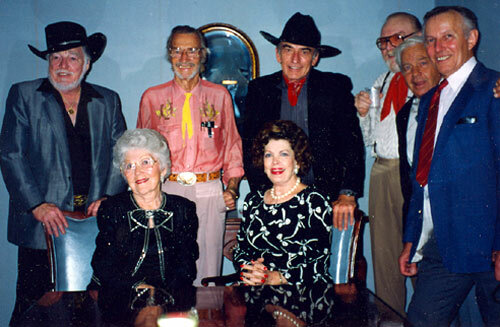 (L-R) Lash LaRue, Lucille Lund, John Pickard, Jane Adams, James Drury, Gene Evans, Frankie Thomas, Jan Merlin. 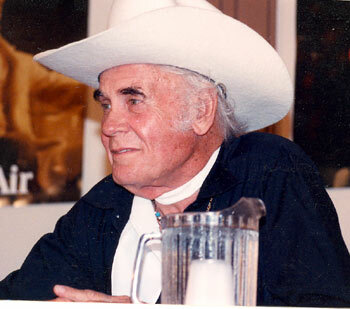 This was “The Virginian’s” first film festival. 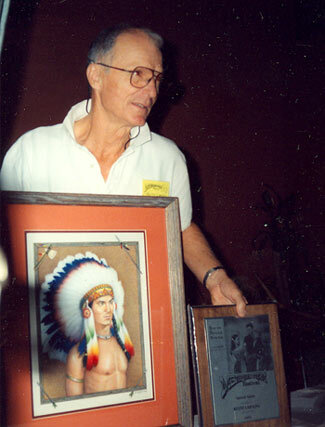 Keith Larsen holds up a painting of himself as TV’s “Brave Eagle” and his award at the Memphis, TN, Film Festival in 1992. 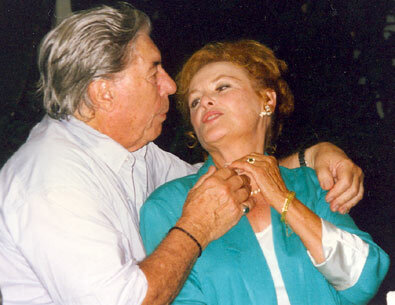 At the Memphis, TN, Film Festival in 1996, Michael Pate and Kathleen Crowley recreate a scene they did together for 1959’s “Curse of the Undead”. 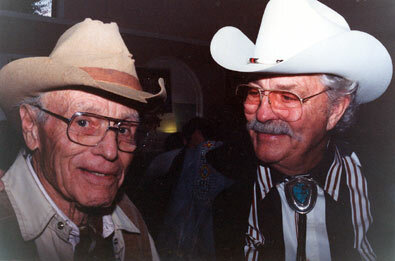 Ben Johnson and Walter Reed at the Sonora, CA, Film Festival in 1990. Three great guys! 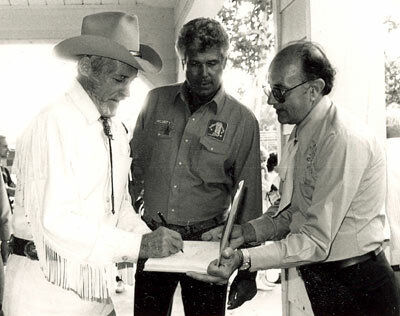 John Hart, Gregg Barton and House Peters Jr. 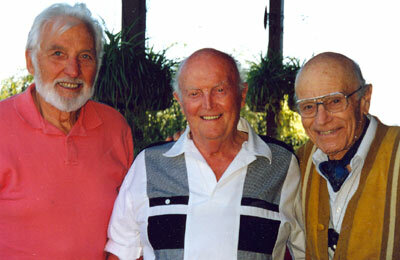 I was privileged to get these three together after many years for a private party at Gregg Barton’s house in 1997. 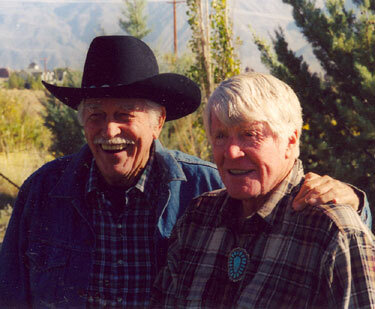 Howard Keel and Robert Horton at the Pheasant Club during the Lone Pine, CA, 2003 Film Festival. 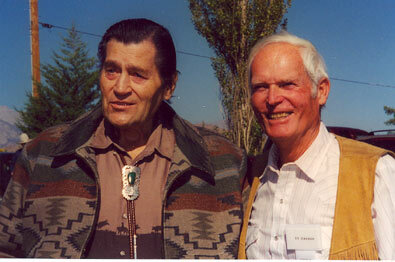 “Cheyenne” and “Bronco”, Clint Walker and Ty Hardin at the Pheasant Club during the Lone Pine, CA, 2003 Film Festival. 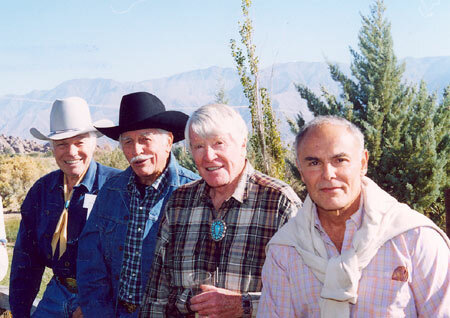 Kelo Henderson, Howard Keel, Robert Horton, John Saxon at the Pheasant Club during the Lone Pine Film Festival in 2003. 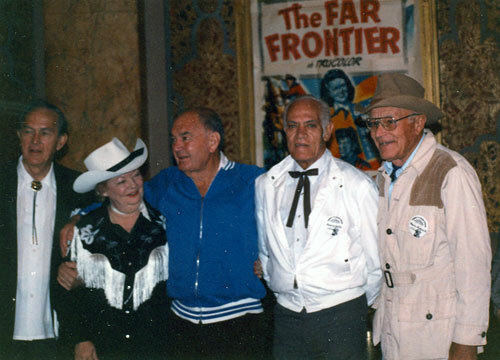 Knoxville, TN, Western Film Festival, 1989: (L-R) Kirk Alyn, Gail Davis, director Bill Witney, stuntman Henry Wills, House Peters Jr.
Rex Allen performs at the 1990 Knoxville, TN, Western Film Festival banquet. 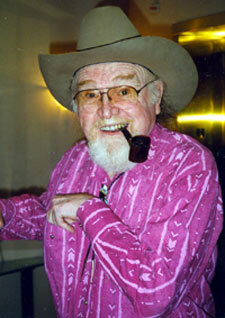 Jovial Gene Evans in Knoxville for the 1995 Western Film Festival. 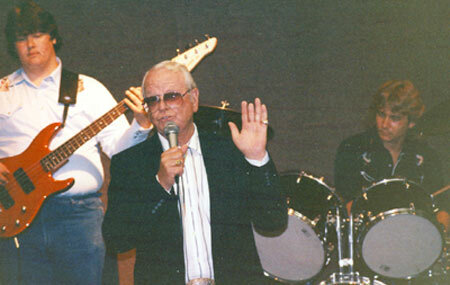 Badman Chris Alcaide and the “Man Without a Gun” Rex Reason at a 1997 Ray Courts Collector’s Show in California. Stewart at a Ray Courts Collector’s Show event in California? 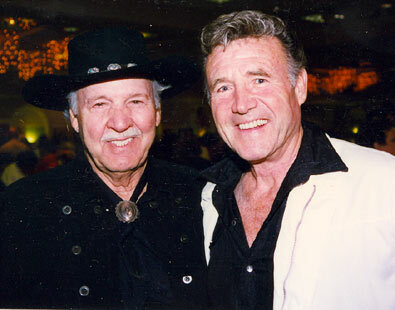 House Peters Jr. and Dale Robertson reunite at a Ray Courts Collector’s Show in California. 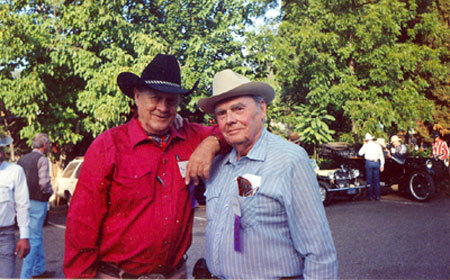 Carey Long, son of Richard Long, and Peter Breck share a few “Big Valley” memories at a Ray Courts Collector’s Show in California in 1998. 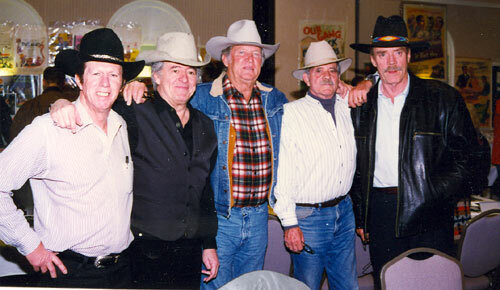 A “High Chaparral” reunion at a 1997 Ray Courts Collector’s Show in California. (L-R) Neil Summers, Henry Darrow, Don Collier, Bobby Hoy, Ted Markland. 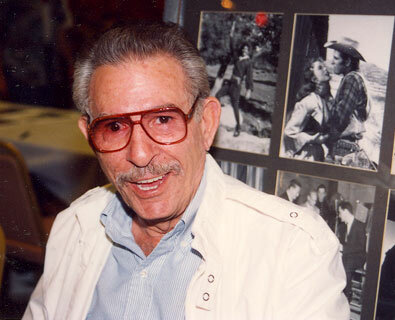 Badman George Keymas at his autograph table for a Ray Courts Collector’s Show in April 1993. 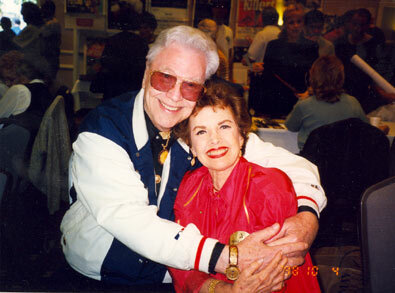 We lost two wonderful people in 2009, Monte Hale and “Our Little Margie” Gale Storm. 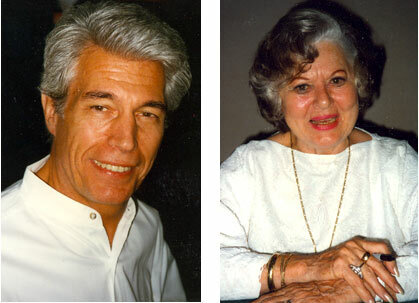 This picture was taken in 1998 at a Ray Courts Collector’s Show in California.